The term Anthropocene is the epoch in which human impact on earth is irreversible. The concept of the Anthropocene was originally a geological reference however, the notion has broadened also to encompass the humanities and social sciences since the perspective of the Anthropocene affects human response to environmental issues on many levels. 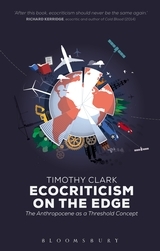 These perspectives are addressed in Timothy Clark’s Ecocriticism on the Edge: The Anthropocene as a Threshold Concept. Clark undertakes the task of exploring the Anthropocene from different view points over nine chapters, taking literary texts as examples to emphasise and highlight disparate aspects of the Anthropocene. Clark offers new experiences with which we understand the world around us through the historical angle when considering the challenges in the Anthropocene, which go beyond the scale and time with which we usually operate in. He also offers how close readings of texts may be a new mode of critical practices as reading of texts may take a different turn while reading in an Anthropocene perspective. The first chapter “The Anthropocene – Questions of definition” offers a history of the term, though he focuses mainly on the cultural, ethical, aesthetic, philosophical and political aspects of environmental issues in the Anthropocene. Clark claims that the Anthropocene “blurs and even scrambles some crucial categories by which people have made sense of the world and their lives. It puts in crisis the lines between culture and nature, fact and value, and between the human and the geological or meteorological” (p. 9). Clark investigates environmental ethics and points out the disjunction of our ‘normal’ scales of space and time, between the “planetary environmental realities and those things that seem immediately to matter to human engagement from one day to another” (p. 30). The matter of scale is at core in Clark’s reading and permeates the book. In the subsequent chapters Clark addresses such issues as new perspectives on readings of poetry, novels and short stories. In chapter six he discusses a post-colonial experience in Australia by in a close reading of Henry Lawson’s ‘Telling Mrs Baker’ (1901) exemplifying the limitations of postcolonial criticism in light of the Anthropocene. This reading as the other readings of literary texts in Ecocriticism on the Edge: The Anthropocene as a Threshold Concept serve as good examples of issues prevalent in the Anthropocene. The book includes analyses of literary works, including texts by Paule Marshall, Gary Snyder, Ben Okri, Henry Lawson, Lorrie Moore and Raymond Carver. In the final chapter “The tragedy that climate change is not ‘interesting’” Clark problematizes the challenge of arguing the large-scale scope beyond people’s everyday lives. Clark also discusses how readings of literary texts challenges, “what may and may not be environmentally significant” in re-readings of texts. Despite the fact that Clark’s book does not deal with children’s texts the notion of the Anthropocene is clearly relevant and of concern within the scope of readings or perhaps re-readings of children’s texts.